These sets include a semi-precious stone cabochon set in a metal bezel over a thin magnet. This magnetic "Half Dome" matches the beads of the necklace and attaches "naturally" to the "attractive" side of 'TTRACTION™ necklace clasps. The stone also attaches to the middle of 'TTRACTION™ open-center ornaments, for which each Cowgirl set offers your choice of "hammered" (shown here) or "sunburst." One of three, small metal ornaments also comes with each Cowgirl 'TTRACTION™ set. 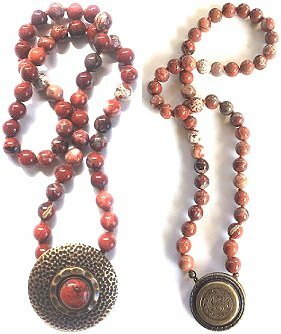 Featured here is the "medallion" ornament on a poppy jasper necklace. A small leaf or decorative rectangle are other ornament options.